Hi everyone. 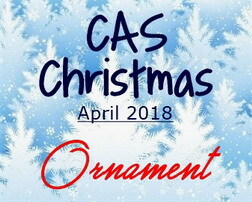 This is a reminder card for the CAS Christmas April Challenge - Ornament, hosted by Bonnie. Today I'm sharing an ornament card that doesn't use an ornament stamp or die. Always great to stretch the use of our supplies, ornaments can be made from lots of different things (stars, snowflakes, circles, etc.). Above I've used my stitched star dies to create some shimmery star ornaments. I cut the star from Be Creative double sided tape, adding a light weight card stock to the one side before cutting. I removed the cover to reveal the sticky side and topped it with gilding flakes. I pressed them down and then used a piece of Rub-it Scrub-it to burnish. I also stamped a background of splatters with gilding flake glue and added flakes to them as well. I hope you'll check out the challenge blog to see the amazing reminder cards from our Designers, and our wonderful Guest Designer, Hideko. I know you'll be inspired. So come join us. The challenge is open for another week, closing at April 24th at midnight (PST). simply beautiful. You said you stamped the background with glue. Was that a versa mark type glue or do you need "real" glue? You are the best! I love this!! I was really stumped on this challenge but I just managed to finish a design I could love on Saturday!! : ) I will get busy and schedule my post thank you for this stunning reminder!! As you know, I love all things stars and I love gilding flakes, so of course I love this card! A fabulous way to do ornaments without ornament stamps or dies!! "Merry and bright" is a perfect sentiment for it too! How beautiful your ornaments look, Loll. When I look at them, I have the impression that they have their thickness and are not flat. The golden layer looks stunning! I love the golden crumbs that are scattered around the ornaments. It's been a long time since I used my gilding flakes so thank you for the reminder, Loll! Love the use of the stars as ornaments too- such a clever idea. Love the spatters done in flakes too- something I'd have never thought to do. Love the sheen on this card! WOW! These stars are amazing and so is the splattered background! So much shine! It's amazing that those flakes can burnish up like this! Makes me think about trying them again. Thanks for the inspiration, my friend! Love gilding flakes. They are always fun to use. Your stars are fabulous Loll and those flaky splatters have made your card stand out so much more adding a bit of finesse. Lovely wee sentiment too. Thanks for reminding me to pull out my gilding flakes for Christmas cards, those stars look so pretty and love the tiny flecks behind. You're so inspiring. Just goes to show card making doesn't need to be expensive to be beautiful. I'm constantly amazed at your cards. They're creative and absolutely lovely. Thank you so much for sharing them with us! so gorgeous mf...love the way you created those. It's a product I have never used before so interested in reading about it. Gilded stars. Gorgeous, Loll and a great ornament. Gorgeous shimmery star ornaments, Loll! I love how you added texture to them and how you used gilding flakes for your splatters...Genius idea and amazing effect!